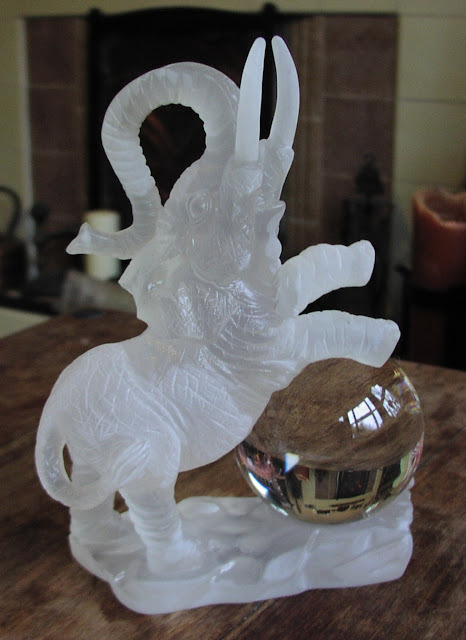 An elephant holding a large crystal ball is pretty bonkers, isn't it? Mind you, when I saw one in a charity shop for a fiver, I had to buy it. Five quid for a crystal ball is pretty cheap, even if the ball is glass rather than a natural stone. My first thought was to simply remove the crystal ball from the elephant - which is made of resin - but I might not. The elephant is something of a totem animal for my coven. We always have a small elephant figurine on covenstead altar - for obscure and oath-bound reasons of tradition - and now I have one of my own. I'm not sure how good a crystal ball attached to an elephant will be for scrying, but I intend to find out soon. But what do you think? Keep the ornament as it is, or prise the ball away from the elephant? What a fantastic find. I too have found some interesting items at our thrift/charity shops. Last week it was an owl container, perfect for holding spell candles or incense. Your owl container sounds lovely.